Apparently some SEOs believe that optimising a site for long tail traffic is not really SEO. I disagree, and below I will explain why. Not sure I agree with that entirely. Another popular definition of long tail traffic is any search engine traffic that arrives on your site using 4 or more keywords. That too doesn’t sit well with me, as many 4+ keyword phrases are actually very popular and can generate substantial volumes of traffic. 1. It needs to be a fairly long keyword, at least 3 words or more. 2. It needs to be a low-volume keyword that doesn’t often get typed in to Google. 3. It needs to be a specific query fulfilling a specific informational requirement. There are large online corporations that exists solely to fulfil the need specified in the third characteristic (Demand Media for one), and some SEOs argue that what these companies do doesn’t amount to SEO. I would agree with that. Churning out massive amounts of content just to satisfy long tail queries is not what good SEO makes. But that’s just one interpretation of long tail. For many other businesses, the long tail means something else entirely. Take an online business that sells white goods electronics. The fat head keywords for this type of business would be generic phrases like ‘dishwasher’, ‘washing machine’, and ‘vacuum cleaner’. The keywords in the chunky middle are often those that include brand names: ‘Bosch dishwasher’, ‘Zanussi washing machine’, ‘Dyson vacuum cleaner’. But the real money for this site is in the long tail. Take a keyword like ‘bosch avantixx wae24366’. The person who types that in to Google knows exactly what they’re looking for – a Bosch Avantixx washing machine, model number WAE24366. This person is probably looking for the best possible deal on that one specific item. If you can rank for that keyword and offer that great deal – for example with a low price, free shipping or extra warranty – you are likely to convert that person in to a paying customer. And that is the real value of the long tail. It’s not about capturing all the possible traffic you can. No, it’s about capturing the traffic that is specifically looking for what you are selling. Ranking for those type of specific long tail terms is not a straightforward task. It’s not just simply about throwing up product pages on your site. You need to think long and hard about your site’s information architecture, about semantic signals like tags, breadcrumb links, and the proper taxonomy. And most of all you need to ensure your site channels its crawl budget to those specific product pages. That takes skill and effort, which pays off in more traffic and more conversions. And that’s why it is SEO. I know it’s something we do, but need to do a LOT more of. Ta very much for the reminder! I was shocked recently to have my beginner’s advice for SEO shot down by someone stating baldly that keyword research was done by people who (1) didn’t care about what they wrote and (2) “skimmed” the internet looking for keywords that would net traffic and profit. (1) is condescending and only applicable in some cases; the recent exposés of how some content farms operate probably lie behind this overly blanket statement. (2) was exactly the opposite of keyword research, as far as I know it and teach it: the key is to figure out what phrases people are using that match your content, not to generate content that matches what people are searching for. I would argue that this is also the difference between good and bad long tail SEO. One thing I’m not sure about: I am like an amateur golfer not pro when it comes to SEO. With instant search and related terms becoming more and more prominent, to what extent are synonyms and related terms being given more weight at the expense of exact phrase matches? That is, if “what’s in a hot dog?” and “hot dog ingredients” are now treated as synonyms by Google (I don’t know if they are, but pretend they are), do they share search results, or will exact phrase match searches still favor one or the other depending on what the user typed in? I haven’t the means to do enough testing to resolve this question, and I suspect the answer keeps changing as Google and other SEs tweak their “related search” factors. Obviously, this question impacts the power of long tail SEO. Hear hear. The longtail is definitely an important part of SEO. I think people using those long tail queries are often much closer to converting. Most of the time they know exactly what they want to know or do (in your post: buying a specific item) and you can tackle them when they are in that buying/converting mindset. We analyzed our own blog and found out that about particular posts, people entered our blog using all kinds of long queries, which were often similar in nature. So, although a specific query didn’t get us much visitors, when you actually look at all the different queries that were used to find and read our blogpost, you could see that they were actually very similar. Add them together, and you have a substantial ammount of visitors, all looking for specific information, only using slightly different wording, and they found what they were looking for (= happy visitors). So, don’t neglect the long tail. Nice article on an important subject. I like this article because it’s concise and lays out the fundamentals clearly. I’ve shared it. We said something similar (but slightly more passionately-worded) this morning (http://www.i-com.net/blog/if-youre-not-optimising-for-the-long-tail-youre-not-optimising-455/). Anyone who isn’t optimising for the long tail isn’t giving their clients a very good value for money service. This just comes back to something which we’re seeing more and more of – so-called experts on SEO blogs aimed at providing advice to SEO professionals offering misleading advice. Funny funny for them in order to linkbait, but not so good if you’re new to the industry and don’t realise it’s a half-truth or something said for the sake of controversy. It’s incredibly irresponsible and really needs to stop. Excellent article Barry. I hadn’t seen this yesterday – but Rishil pointed me to it this morning right after my article on the subject came out over at SEJ. You bring up a really important aspect of what’s involved with long tail beyond just content. The IA, taxonomy, breadcrumbs for example. I also include internal linking – from within content as part of what drives long tail. The more well optimized each page is, the better multiple pages are organized, and how you send signals to search engines about those all drive better long tail results. I’ve seen it with my own eyes. The fact that significant revenue comes from it should be the reason site owners should care. The complex work of SEO that factors in SEO should be something people in our industry learn more about. The emphasis you ultimately suggest here on “conversions” is appropriate. Traffic doesn’t equal profits, conversion does. 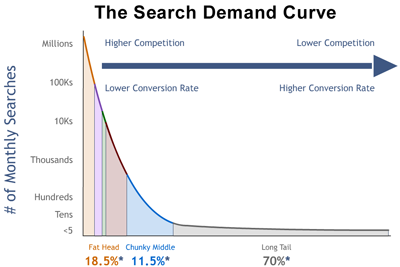 the beauty of the long tail is not just that they are easier to rank for, but they are easier to convert. Barry, what other aspects of search do you find important for a sustaining online business? Got that right. All of my flourishing websites do so because of the long tail. The nice part about long tail keywords is that you don’t have to actually optimize for them. Quality content will bring it on it’s own. Pingback: Seo Information Search » Blog Archive » Is Long Tail SEO Really SEO? “That takes skill and effort, which pays off in more traffic and more conversions. And that’s why it is SEO.”. Well… I’ve been heard to say “LT isn’t SEO”. Targeting non prioritized long tail Keywords, cuz ya can, is what I was on about. I prefer to set a bar for a professional activity… I think that is what Jill is on about. It’s one thing to call a Sunday duffer a golfer… it’s another to consider him doing the same thing as the guy on the PGA Tour. Seems peeps can differentiate that… if we don’t do it…. the part timer who sold the JC Penney links to Searchdex is considered to be doing what brilliant SEOs like Barry are… let’s set a bar and be done with it… otherwise Demand Media are likely the best SEO company on earth… not sure I want to be thought of as doing what they do. SEO has moved way past that level of sophistication. @Alan I just read your SEJ post, good stuff and thanks for linking to me. Like I said in my comment there, I think I know why Jill says what she says, but by not putting it in the proper context she’s spreading disinformation. It’s one type of long tail traffic generation that she’s opposed to, which is not what the industry as a whole understands as “long tail SEO”. @Travis I think the essential aspect of a sustainable search strategy is to be nimble and adapt. Things change so often, we need to keep on top of things – but never get carried away by the hypes that permeate our industry. @Terry what you refer to is one small aspect of what could be seen as a long tail SEO strategy. But it’s not what long tail SEO is really about, imho. I agree that what Demand Media and such are doing is not proper SEO – for one there’s no ‘optimising’ involved – but a blanket statement like “long tail isn’t SEO” isn’t really doing anyone any favours. I agree with your post and the comments, but honestly I just want to see Jill Whalen start arguing about this again 😉 Anyone else? Most keyword phrases are highly competitive and difficult to rank for because everyone is using them. Regular keyword phrases have the greatest competition. Longtail keywords are generally keyword phrases greater than 3 words. Longtail keywords are word phrases that are becoming more prevalent in online internet marketing. Other keyword phrases are over used and longtail keyword phrases offer an alternative at getting more traffic from words that are not used very much globally. Longtail keywords are valuable but not highly competitive which makes them a great resource to use in website meta tags and article writing. There are longtail keyword generators. You are also welcome to leave a comment there.